The Regions Prestige Visa Signature Credit Card currently has an Informr score of 4.8 out of 10. This score is based on our evaluation of 1 sources including reviews from users and the web's most trusted critics. 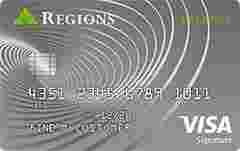 Regions Prestige Visa Signature Credit Card is typically available to those with good credit scores (650 or greater). Earn twice on qualifying purchases made in the first 90 days after account opening. As a rewards card, the Regions Prestige Visa Signature credit card takes the meaning of “no frills” to the next level. It comes with a meager sign-up bonus and a weak rewards program with a low rewards rate of one point on the dollar – a rate far surpassed by many if not the most rewards credit card programs out there. The much touted “Relationship Rewards Program” doesn’t offer any sizeable benefits for banking with Regions Bank.